In four raids between 13 and 15 February 1945, 722 heavy bombers of the British Royal Air Force (RAF) and 527 of the United States Army Air Forces (USAAF) dropped more than 3,900 tons of high-explosive bombs and incendiary devices on Dresden, Germany. The bombing and the resulting firestorm destroyed over 1,600 acres (6.5 km2) of the city center. An estimated 22,700 to 25,000 people were killed. Critics of the bombing argue that Dresden was a cultural landmark of little or no military significance, and that the attacks were indiscriminate area bombing and not proportionate to the commensurate military gains. Prior to the three-hour performance at the Hole of Fame gallery, in Dresden, Germany, Michael Barrett self-published a small book that included the words “I’m sorry”, repeated 25.000 times, one for each casualty. While standing in front of the gallery window and wearing a military flight suit, Barrett read each word, page by page. 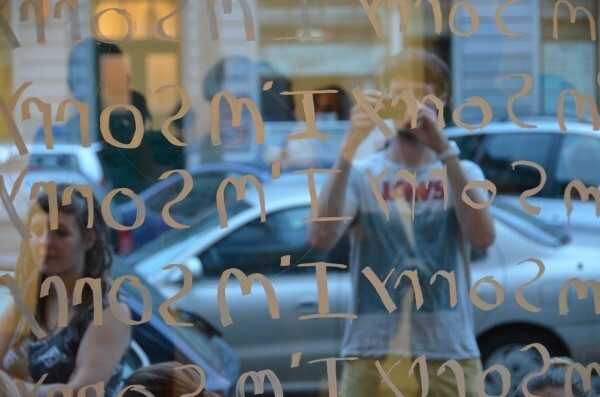 After completing each page, the words, “I’m sorry” were written on the gallery window, projecting itself on passerbys and the city of Dresden itself. Once each page of the book was read and the gallery window had been covered with the text 71 times, Barrett placed the book on the floor at the foot of the gallery window and proceeded to leave the area. 71, marks the number of years since the happening of the firebombing. PAS #48, Between the Lines, in cooperation with University of Dresden.